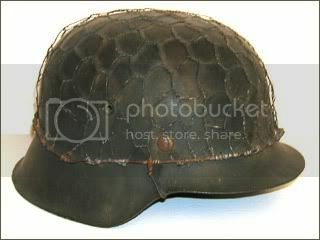 Introduced in 1935 this model helmet featured a new liner system, which was designed in 1931. 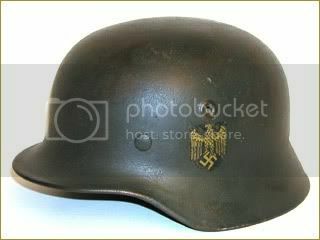 This helmet style was simplified slightly in 1940 and again in 1942. 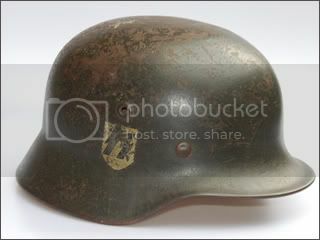 This example features the national tri-color decal as well as that for the German army, along with the pre-war "apple green" paint. 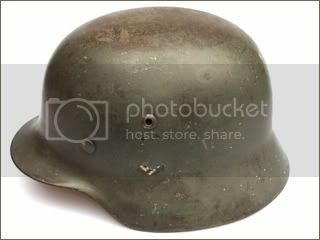 This example was originally a double decal army helmet. At some point the decals were removed, and just the bottom of the army decal can be seen. This single decal example features the "Normandy" camo pattern paint. 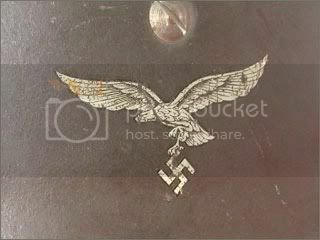 This example features the national tri-color decal as well as the eagle inflight decal for the German Luftwaffe, and smooth pre-war dark blue paint. 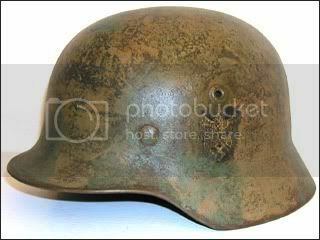 Designed in 1936, and reworked in 1938 this helmet was used by German paratroopers (Fallschirmjagers) as a jump and combat helmet. 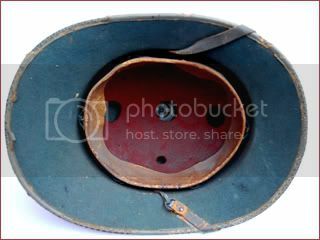 This particular example features wire around the rim for camo purposes. 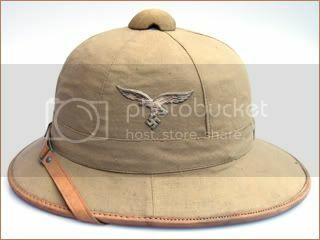 It was obtained from the son of a vet who said his father was at the battle of Monte Cassino. 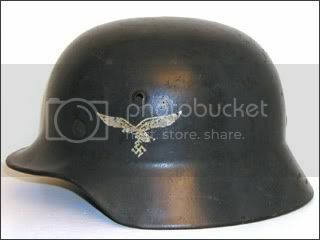 This Kriegsmarine (Navy) helmet features a gold colored eagle decal rather than the silver of the Heer/Army. 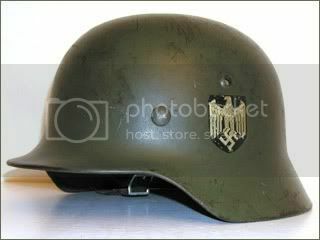 Single decal Waffen SS helmet, which was brought back by Louis Suciu, member of the United States Army 104th Infantry Division. 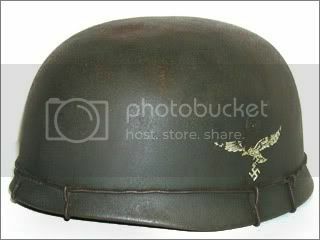 The helmet was "captured" in Belgium in the fall of 1944. 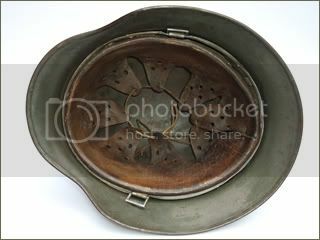 This M42 example features a chicken wire basket, which was used as a means of applying camouflage in combat. 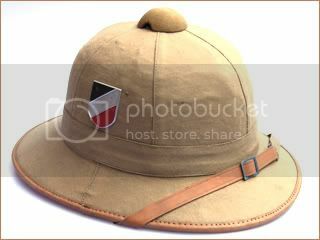 An early sun hlemet from the War Navy. It is a pre-war manufacture circa 1933 to 1936. 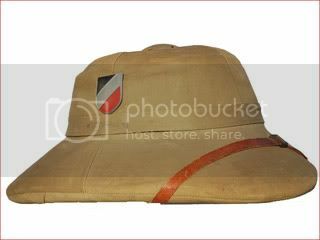 It is made of starched canvas, whitened outside over cork. It features the national eagle above the state cockade. 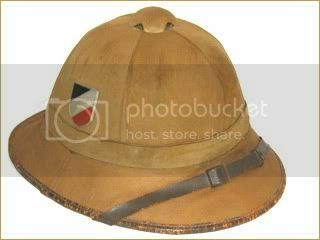 It also has a band, which was likely used for the naval capband, a practice that disappeared as war approached. 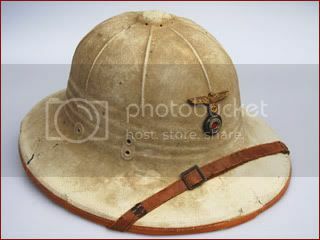 An early first pattern sun helmet used by the Kriegsmarine. 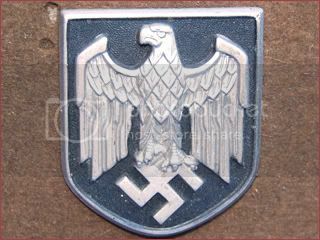 It features helmet plates without the border usually seen on the army models, and a gold eagle instead of a silver one. 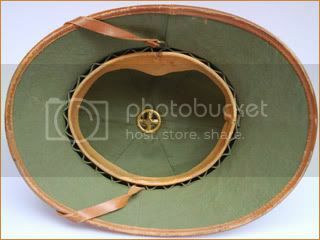 The second model of the first pattern sun helmets featured six panel construction, and were made of compressed cork and covered with segments of canvas cloth. 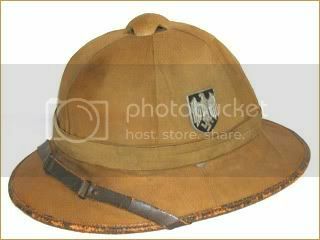 These helmets were widely issued but were not popular with the troops in North Africa and were generally discarded in favor of field caps. 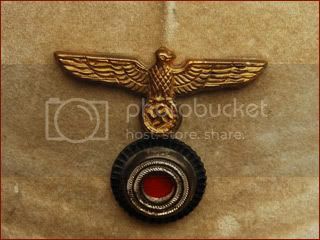 This particular example was made for the German army and is dated 1941. 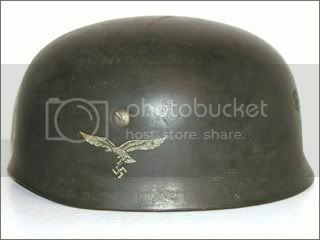 A four panel gray/blue sun helmet, made in France and used by the German Luftwaffe. 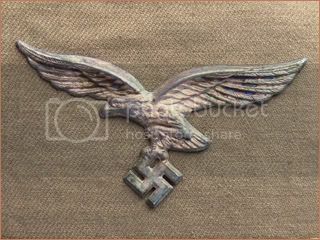 While this pattern is likely based on the French M31, there is no evidence these were intended for the French Air Force, and likely were produced for the German forces in gray to match the Luftwaffe uniforms in Europe. 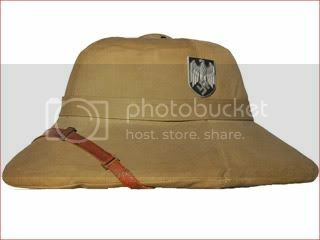 This German sun helmet features the Luftwaffe insignia instead of the army shield. 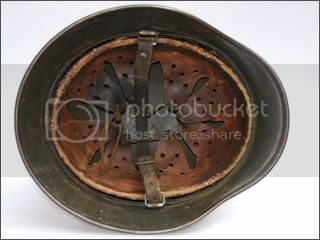 These helmets were used in North Africa and in South Europe. 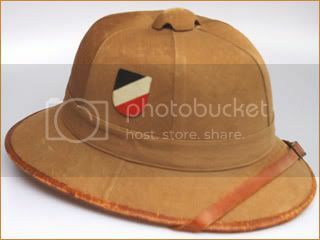 This second pattern German sun helmet was made of pressed felt in the same basic shape of the previous models. 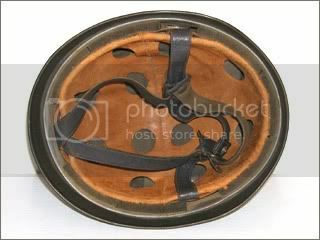 These helmets were widely used in South Europe. 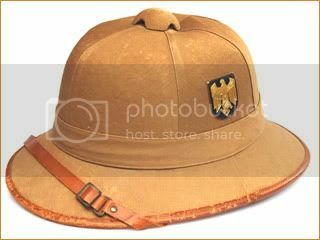 A variation of the second pattern German sun helmet, featuring a flatter top. 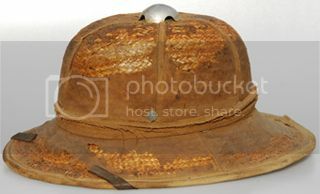 A first pattern, canvas covered helmet - while in relic condition shows the straw weave pattern under the canvas. 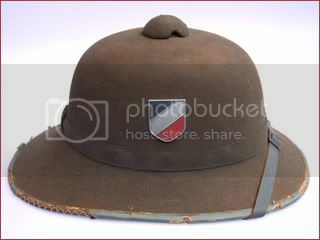 In addition to cork helmets, straw was used as a wartime material. 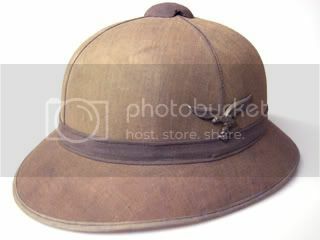 This is a British-made khaki sola pith helmet, which was adopted by the British Army in the 1930s to replace the Wolseley pattern helmet. 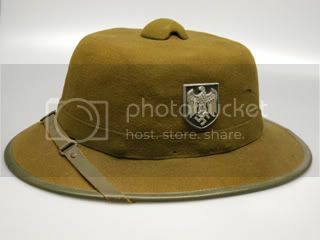 These were in wide use in Greece during the German invasion, and period photos suggest these were copied and widely reissued to the German Army. 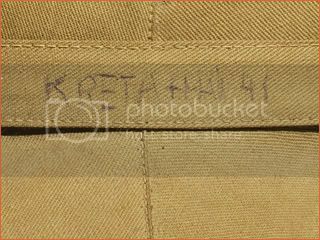 This particular example German Afrika Korp helmet plates, and written on the right side are the words "Kreta, May 1941," which would correspond to the German invasion in late May of that year. 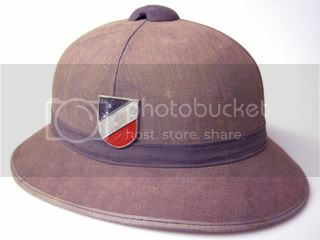 This example came from a collector, who had obtained it from a veteran who had served at Crete.